Over the last few years PVC-U systems companies have really upped their game in terms of delivering new and innovative products. Fabricators have benefited greatly by being able to manufacture windows and doors that match the aspirations of the modern homeowners. Sitting in the middle of this are the growing numbers of installers and retailers who have been able to adapt their own product ranges to reflect the changing fenestration tastes of consumers. Deceuninck has been pioneering the growth of colour and flush sash products in PVC-U and these are the headline areas that have attracted more and more fabricators to Deceuninck for their PVC-U profiles. Colour isn’t a ‘special’ at Deceuninck as the company holds 26 colour ways in stock and which helps make selling colour as easy as selling white. A visit to the UK foiling manufacturing facility in Calne is evidence in the growing popularity of the colourways offering. The latest foiling machines are working overtime to feed the demand from customers. 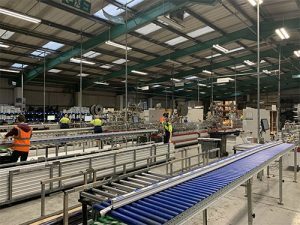 In fact the whole factory is a hive of activity from the PVC-U extruders pumping out lengths of PVC-U profiles to the new showroom rammed with the latest products including the delightful flush sash door and ingenious Invisifold system. In the commercial arena the Linktrusion™ patented composite technology that combines pultruded glass fibre with PVC-U is gaining market traction and was recently awarded the ‘Product of the Year’ at the G18 Awards. Rob McGlennon adds: “Linktrusion™ is a real innovation and it is already making a big impact in the commercial sector. Our 5000 window and doors with Linktrusion™ combine outstanding performance with a flush, contemporary appearance that specifiers love.” The hard work and investment that has taken place at Deceuninck is really starting to pay dividends. 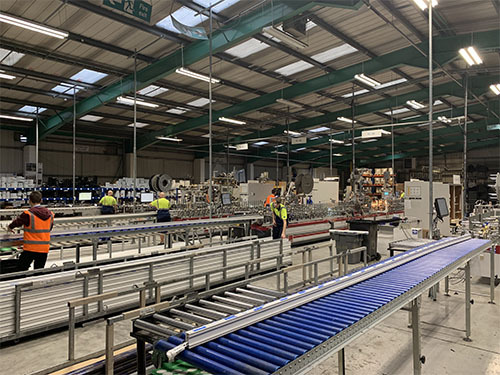 The hard evidence of a busy manufacturing facility, a constant flow of new products coupled with new customer gains demonstrates Deceuninck is making waves in the marketplace.